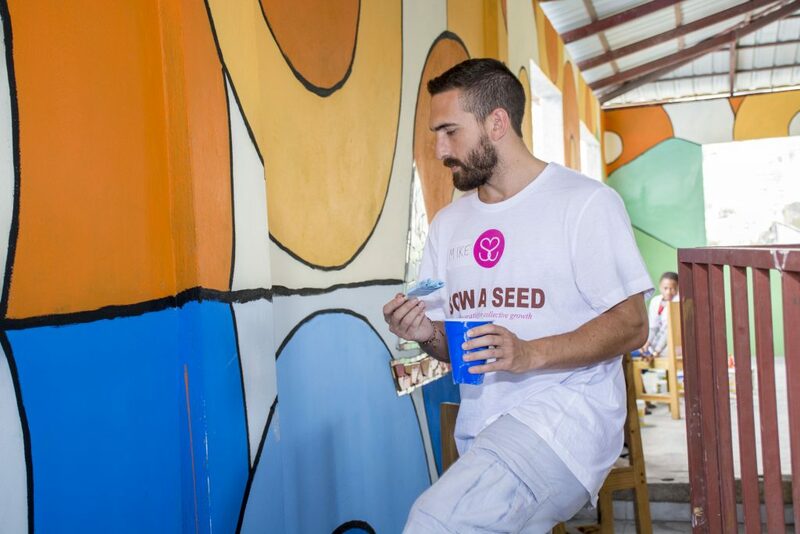 The mission: first to create a recreational room space for Timkatec youth center and orphanage with mosaic/ painted murals and second to engage and educate the artistic orphans of the facility furthering their development in the arts. This renovated space was to be used for our wellness program (yoga/meditation), arts program, theatre/dance/music workshops and educational seminars and events. With the support of this project’s sponsors IBO cement, Metro Security Haiti, Kinam Hotel, Matpar Paint, Italceramici, Ministry of Tourism, Wahoo Bay Beach Club, commissioned Miami artist Michael Halley designed and led the painting portion of the mural while local Haitian artist, Mario Jeudi was contracted to teach the kids the Mosaic portion the mural. 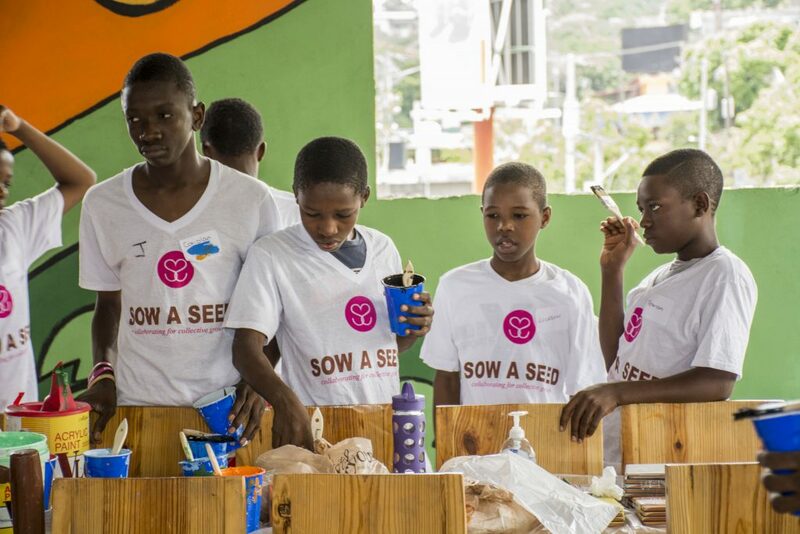 A total of 50 kids aged from 12 to 19 years from Timkatec youth center and orphanage alongside local community volunteers and SAS members partook in the project. Children learned the spirit of communal collaboration on a shared collective project that better their community and facility. The concept was to bring the outside landscape peering through the windows into to the room creating a fantasy of what a more colorful Haiti could be. “Hope in Color for Haiti”. Located in the center of Petion Ville, giant window openings of the room facing the mountain’s multicolored Jalouzi neighborhood, one haiti’s tourist attraction revealed the base for our work. 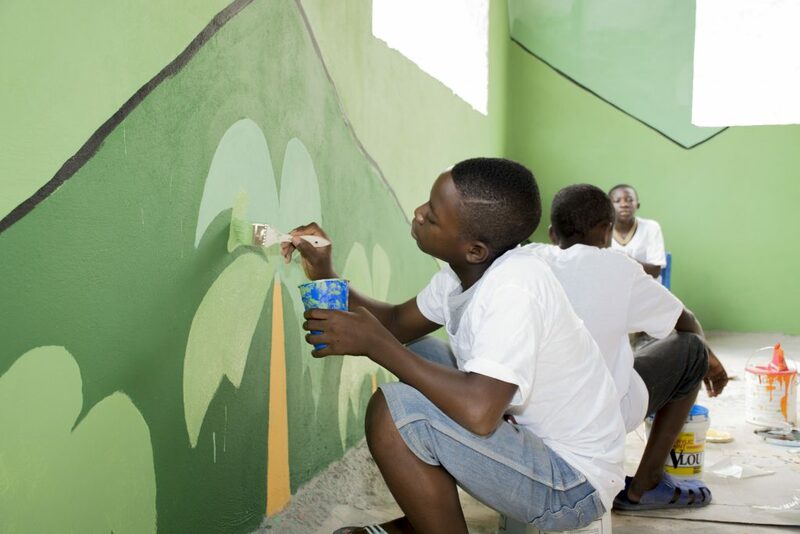 As we painted our greener mountains with palm trees, we created a more colorful Jalouzi onto our mural. 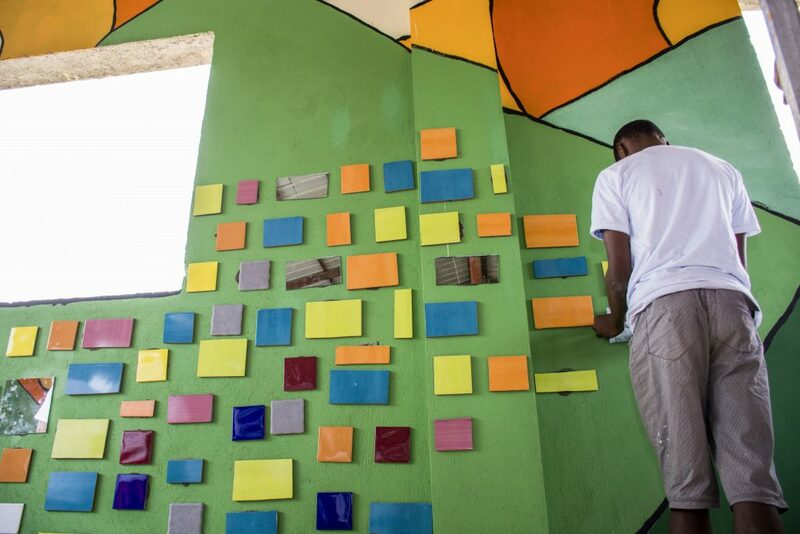 Ceramics donated by ITAL Ceramici S.A. were being glued onto the walls creating little colorful homes filling our mountains with endless colors. 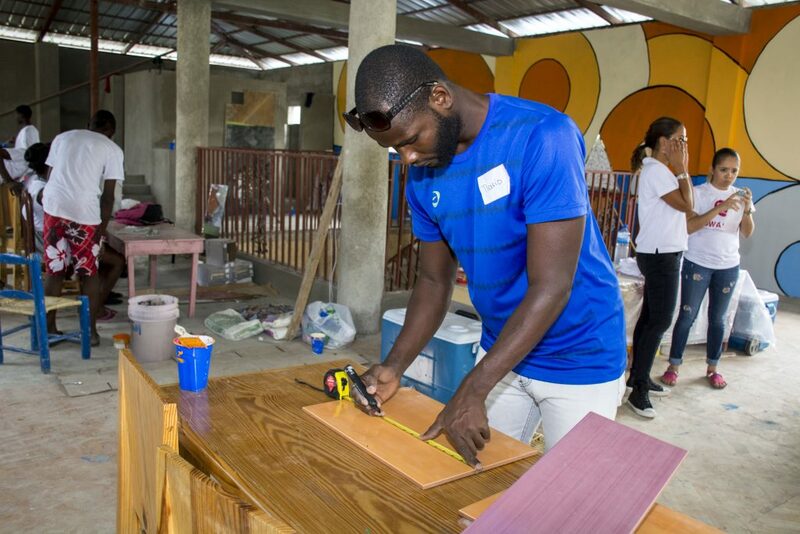 Each child and volunteer had glued their own little home, signed their names into it, creating a collective colorful community inclusive of all participants. On the side walls facing the oceans, again the outside concept was used to paint reflective sunshines and waters in shades of oranges and blues with mosaic made typical Haitian fishermen sailboats floating through this new shared dream. The once gray bleak space of the room was now filled with light, warmth, love, friendship, color, music and joy. This room is pridefully being used currently for all recitals, workshops, programs and events serving the orphanage of 600 children.